Structural vulnerability assessment is one of the key components of NORSAR’s research and collaboration projects in worldwide earthquake-affected regions. Structural vulnerability defines the potential of a particular class of buildings or infrastructure facilities to be affected or damaged under a given ground-motion intensity. Comprehensive engineering assessment and design services of standard structures and bridges using advanced structural modelling and analysis procedures: nonlinear static performance-based design, nonlinear dynamic. Comprehensive evaluation of seismic vulnerability (structural, non-structural and operational) for a wide range of existing buildings and structures, such as residential and commercial buildings, public/governmental buildings, industrial facilities. Detailed retrofitting and strengthening measures to increase earthquake safety (i.e., improve the dynamic earthquake response of the building) and mitigate the effect of a defined earthquake threat. Mitigation solutions are defined taking into account the societal-economic condition of our clients and the regional environmental context. A structural vulnerability assessment generally provides a clear picture in understanding the vulnerability of a certain structural system typology, i.e., its susceptibility to suffer damage, and how this vulnerability is affected by the various structural and non-structural components. The outcomes of a structural vulnerability assessment are used as input data when developing prevention and mitigation measures (e.g. strengthening and retrofitting), as well as building code provisions and guidelines. A great number of methods and procedures, which range from basic to more advanced procedures, are available for both modelling and measuring structural vulnerability. The choice between the different methods depends on the degree of risk, i.e., the criticality of the selected building/facility, and the likelihood of unacceptable consequences in case of an earthquake disaster. The repeat of the structural vulnerability assessment process for various ground-motion intensity levels (i.e., conduct continuous correlation between physical damage with a measure of ground-motion intensity) will result in the development of fragility curves. These analytically derived fragility curves define the conditional probability of the seismic demand placed upon the structure exceeding its capacity for a given level of ground-motion intensity. Furthermore, the measured seismic demand imposed by a given level of ground motion can be translated into economic or monetary loss (i.e., estimation of repair and reconstruction costs) by convolving the building response with the cumulative cost of a given damage state. 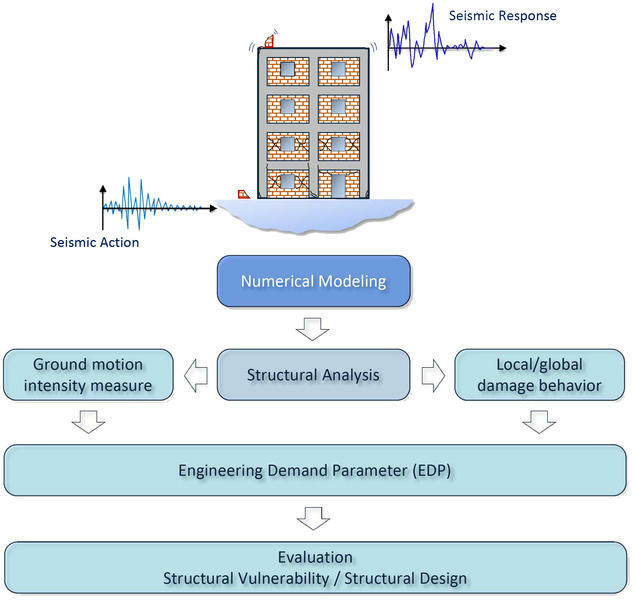 The repeat of this process for various ground-motion intensity levels will result in the development of a Mean Loss Curve that can be used to predict the economic loss consequences of various earthquake scenarios.